Parents are asked not to pack children’s lunches in insulated bags for 2 reasons. 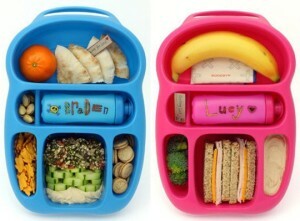 Please pack your child’s morning tea & lunch in one box and have it clearly labeled with your child’s name. Please ensure the drink bottle is either plastic or metal and labeled also. In order to reduce our carbon footprint, Bellingen Preschool is requesting that the children’s food is not wrapped where possible. Lunch boxes with compartments are ideal for this. Please see picture. If you pack yoghurt, fried rice or other foods requiring a spoon/fork, please provide one for your child. Also make sure any containers are able to be opened by your child, practicing this at home gives your child confidence to perform this task at preschool. We have bins for the children to get used to the red, yellow, and green for recycling. We also have a worm farm for food scraps. Bellingen Preschool is a fun loving place, but we also have guidelines and policies to give your child the best possible care while here with us. Our friendly staff are experienced and trained to the highest standards. To learn more about them, click the link below. Looking for Community-based Preschool? Bellingen Preschool Inc. is about children, families, education and the community. If you’re interested in enrolment click below. © 2019 Bellingen PreSchool. Website by Coast.